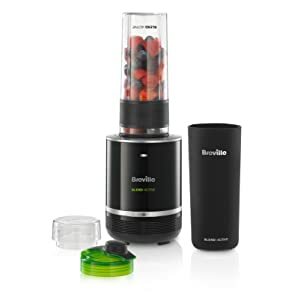 Breville Blend-Active Pro Blender, 300 W - Black. 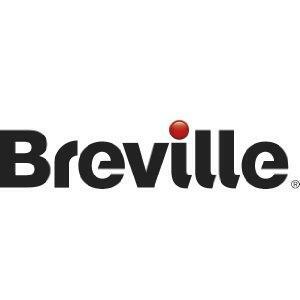 Suitable for those who are serious about their active lifestyle or fans of the Breville Blend-Active looking to step it up a notch, the Breville Blend-Active Pro is a personal blending product. Featuring all the simplicity that makes Blend-Active such a success, the Blend-Active Pro introduces a sleek, premium style and a set of good features that take your personal blending to the next level. Always a good way to get your five a day, looking after your health and nutrition is easier with Breville Blend-Active products - juices, smoothies and shakes are just the press of a button away. This model featuring a black blending unit with chrome accents and matching 500 ml bottle, will look good on any worktop. With a 300 W motor, angled stainless steel removable blades and a pulse function, you can blend the toughest ingredients; including nuts and ice. The Blend-Active Pro includes a different shape base unit and bottles - but don’t worry, you can use Blend-Active bottles from any product in the range with the Blend-Active Pro, as well as the one included. 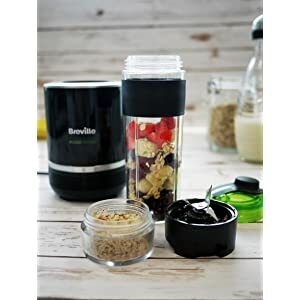 The Breville Blend-Active Pro is a personal-sized blender that uses a sport bottle, giving you one-person-portion fruit smoothies, breakfast drinks, protein and sports nutrition drinks and iced juices with a one-touch action. Suitable for commuting or as a crucial part of your gym kit, your Blend-Active is suitable for taking to work or the gym or simply keeping it with you in your home. 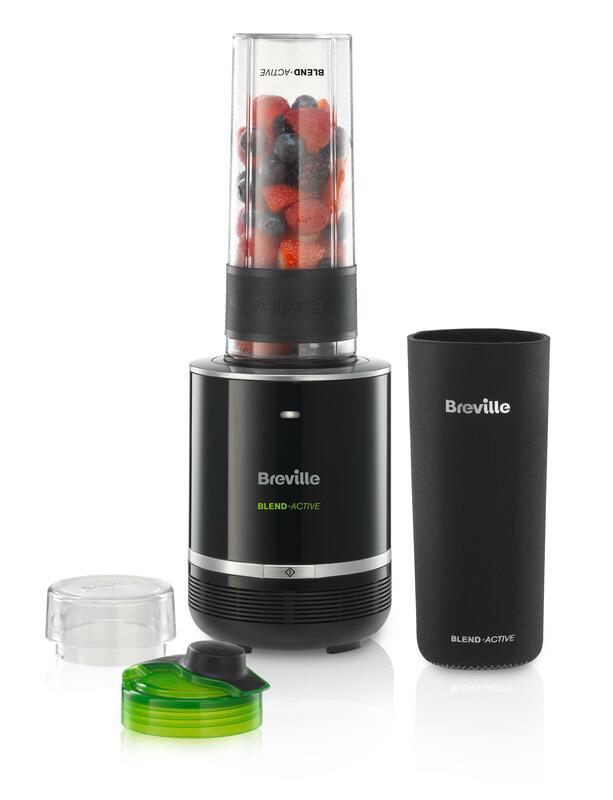 Pop your favourite ingredients into the Breville Blend-Active Pro sports bottle and attach the blade unit. The Blend-Active one-touch action means you just pop the bottle on to the base, twist to lock and then press the button to blend your drink. The Blend-Active will blend a smoothie or a shake in seconds. Once you have blended to your liking, replace the blade lid with the leak-proof sports lid. Your blended beverage is then ready to take with you wherever you go; to work, to the gym or with you in the car. You can crush ice meaning you can make delicious iced-juice slushies. The blade unit comes with a protective safety cap to keep those sharp edges covered when not in use - but more than that, the safety cap can be used with the blades and unit to become a spice grinder, meaning you can go pro with your cooking too. The Breville Blend-Active Pro bottle has a black non-slip grip and also features a removable neoprene sleeve that provides insulation - keeping your drinks cool - as well as better grip for when you’re getting serious with your active lifestyle. It looks sleek and smart too. With a small, but powerful chopper you can crush ice and chop tough fruits or nuts, meaning you can make delicious iced-juice slushies, extra thick smoothies and breakfast drinks. Unlike protein shakers, the Blend-Active's design prevents powder collecting around the edges for an ultra-smooth drink.